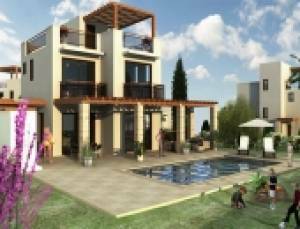 An exclusive project of 9 villas, each with its private landscaped gardens, pool, BBQ area and roof terrace overlooking the calm waters of the Mediterranean. Only a 50m strip of land separates the project from the sea where you will find a sandy stretch of beach ideal for swimming and sunbathing. The development is on the coastal borders of Agios Theodoros village and the coastline that stretches from the cosmopolitan village of Kiti to the picturesque fishing village of Zygi, renowned for its fish taverns and now boasting a new marina and fishing harbour. The 9 villas are accessed by a private road, which leads to the driveways of each villa, expertly positioned on the gently sloping plot of land providing ample views of the Mediterranean from all levels. The villas are contemporary in design providing a basement level, comfortable living and entertaining areas on the ground floor, bedrooms with en-suite and shared bathrooms on the first floor and roof terraces on the top. The properties are finished in earthy color tones with stone trimming; a tribute to Cypriot and traditional island architecture. *NOTE: Individual Villa floor plans available on request!